Hammerite Direct to Galvanised Metal Paint is specially formulated for application straight onto non-rusting metal, such as galvanised steel, aluminum, copper and brass, as a primer and topcoat in one. Available in four popular colours, Hammerite Direct to Galvanised Metal Paint enables you to create the look of your choice and, with its one coat application, painting these tricky metals has never been quicker or easier. Abrade Aluminium, Copper and Brass to improve adhesion. On aged, dull galvanised surfaces spot prime any corroded or oxidised areas where the galvanise has broken down with Hammerite No1 Rustbeater. On new, bright, galvanised surfaces, leave to weather for a number of months until duller and coarser before application of Hammerite Direct to Galvanised Metal Paint. 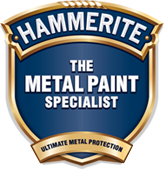 For maximum protection and a longer lasting finish, apply 1 coat of Hammerite Special Metals Primer first. Where the surface has been previously painted, it is recommended that a small test area is applied. Leave for 1 hour. 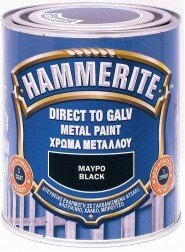 If there is a reaction remove all paint before applying Hammerite Direct to Galvanised Metal Paint. Please refer to back of pack for specific application instructions. After use, remove as much paint as possible from brushes before cleaning with Hammerite brush Cleaner & Thinners. Do not use or store in extremes of temperature. How do I paint directly onto a rusty metal surface? Hammerite Paint is specially formulated to be applied directly onto rusty metal with minimal surface preparation. Simply remove any loose rust with a wire brush or coarse sandpaper and clean the surface with brush cleaner & thinners and allow time to dry. Then apply Hammerite Paint directly onto the rusty metal surface. No primer, no undercoat needed.